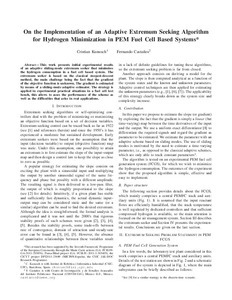 Kunusch, C.; Castaños, F. On the implementation of an adaptive extremum seeking algorithm for hydrogen minimization in PEM fuel cell based systems. A: European Control Conference. "Control Conference (ECC), 2013 European". Zürich: 2013, p. 2501-2506.